As you fly over the rugged, tree-clad landscape you realise you truly are getting away from it all as signs of human habitation are few and far between. 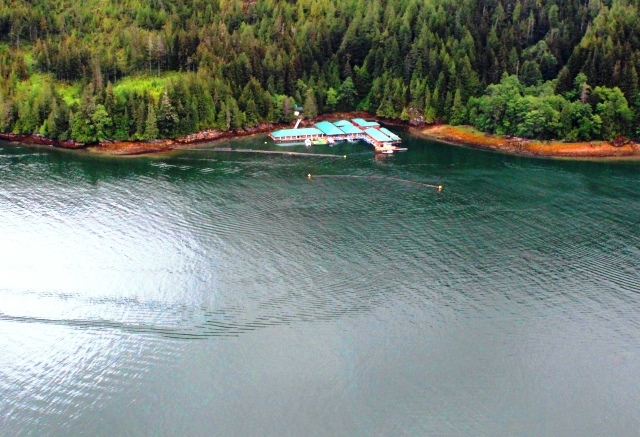 The aerial view of Knight Inlet Lodge, nestled on the shore of Glendale Cove highlights its isolation amidst the magnificent forests, snow-capped mountain and fathoms-deep fjords of the Pacific Northwest region of Canada. With just 18 guest bedrooms, the Lodge is never over-crowded. The rooms have queen-size beds, en-suite bathrooms and views out across Glendale Cove or craggy rocks. However, there is NO TV in the rooms and NO internet, so you have SWITCH OFF! Yes, it may sound a bit like going ‘cold turkey, but believe me, it’s not difficult to do and you very quickly adapt to a different pace of life. 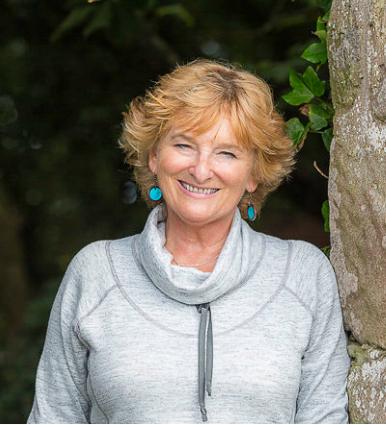 With excellent food (meals and wine included), interesting talks every evening and like-minded guests from around the world to chat to, it’s easy to keep occupied – or just relax and watch the ever-changing scenery outside. 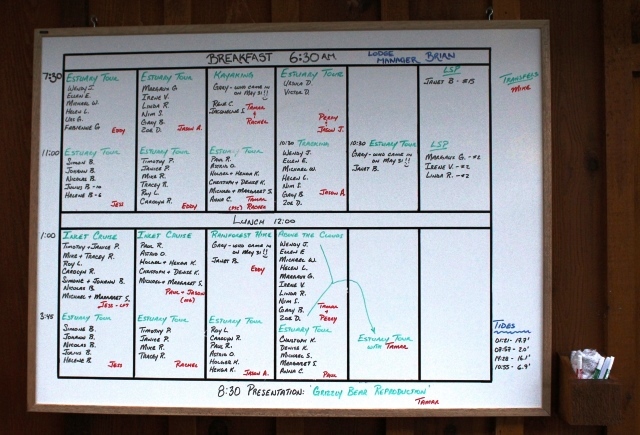 The daily itineraries are well-organised into small groups which mean you get to know others but in a low-key way. 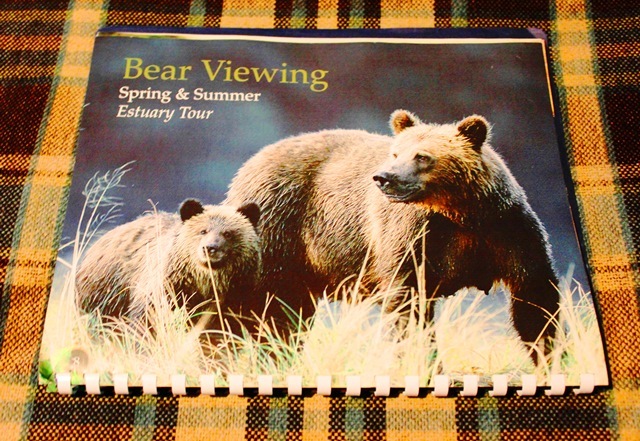 Each day there are grizzly-bear viewing tours, up until August by boat and during the salmon season from Viewing Platforms over the river. These are the highlight of the stay and why most people come. 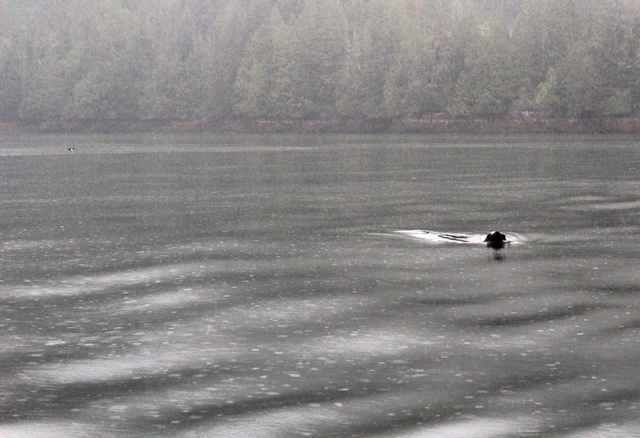 Puttering out into Glendale Cove in the rain in a little boat in search of bears is one of the most memorable things you will ever do. The mist swirls around the shoreline, shrouding all like a scene from a Japanese woodcut. Sea gulls and herons perch atop barnacle-encrusted jetty posts or on half-sumberged rocks. Little ducks called marbled murrelets, described by our guide as ‘floating potatoes’, dive below the rain-pocked water and overhead a bald eagle swoops down onto its giant nest. Once the engine is switched off it’s the silence that enchants. Gradually the natural sounds of the Inlet come to the fore. The swooshing of waves as a pod of dolphins comes alongside for a quick play. Raindrops pattering on the roof of the boat and onto the surface of the water all around. The swirl of water as a curious sea-lion pops its head up to see what’s going on. 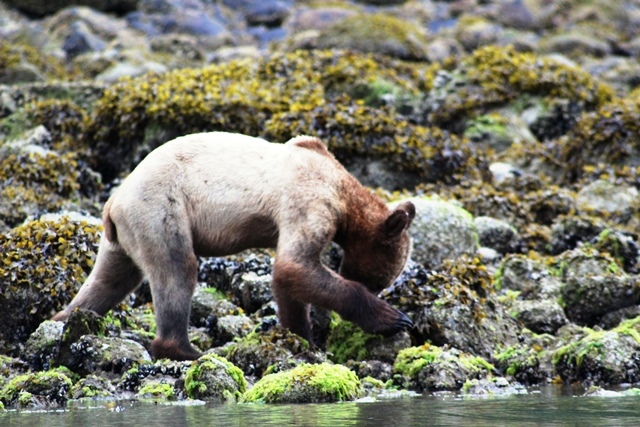 Then, on seeing a bear, you hear the crunch of its jaws as it munches its way through mussels and tiny shrimps on its endless quest to fill its stomach after months of hibernation. Of course, camera shutters click and videos whirr but you get so long to look, that eventually you know you’ve got enough photos and stop so you can enjoy this life-enhancing scene. The bears, used to humans watching them all day long, take little notice and go about their daily business oblivious to the pleasure they bring. Yes, I’d have liked one more day to be able to enjoy the simple pleasure of sitting on the deck of the Lodge and watch the natural world go by for a few hours. 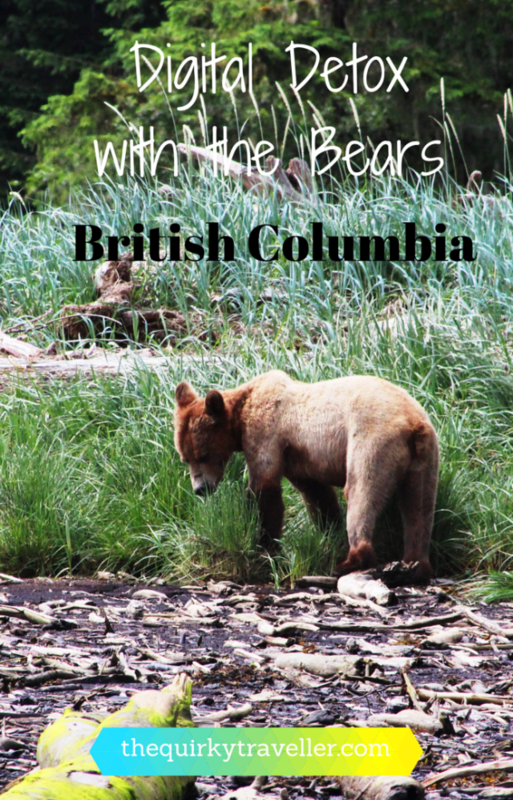 We stayed for two nights and, though almost every minute was busy, including going ‘bear-tracking’ and on a fast boat cruise of Knight Inlet (find out more on my Bear Watching trip to British Columbia), I found the whole experience both absorbing and de-stressing. Being totally immersed in this ruggedly beautiful environment, far from the world of technology, sharing it with diverse wildlife, was a potent reminder of what really matters. Many thanks to everyone at Explore Canada and Destination British Columbia for an uplifting experience. Inspired to find out more? 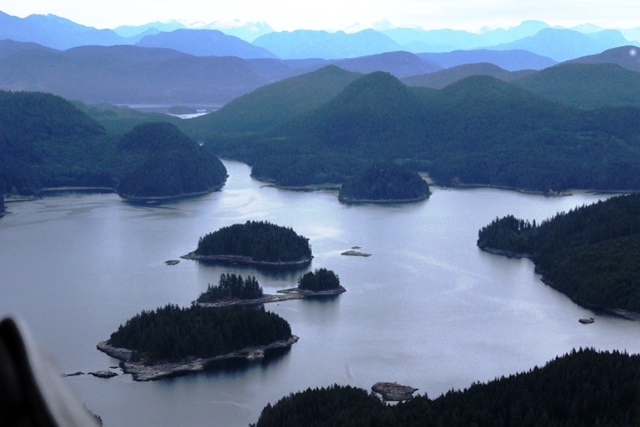 Discover more about Knight Inlet here and the delights of British Columbia. While I was staying at the nearby Great Bear Lodge I found the forest so captivating that I didn’t miss the internet at all and for anyone who knows me that really is saying something! 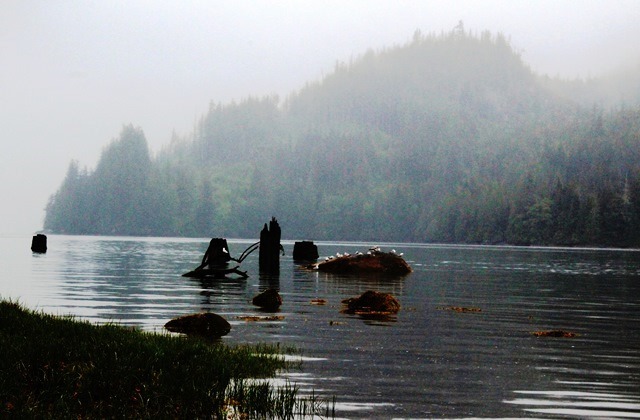 The Great Bear Rainforest is the most bewitching place I’ve ever been and from the sounds of it, it was for you too. Great story Zoe! I love the term “digital detox” which is not only true but a catch name. 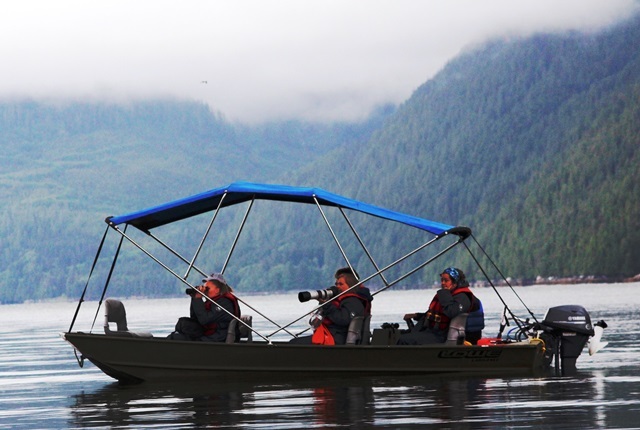 You capture the magic of the lodge which is the remote location, how you get there, staying on a floating lodge, the scenery, the peace and quiet and of course the bears! Overall a wonderful article which I will be sharing with family and friends. Phil – it was lovely to stay with you and please pass on our gratitude to everyone who made the trip so special for Gary, Nim and me. Hope you also enjoyed the other post and watch the float plane video 🙂 Hope the bears have a safe hibernation and all the best for the 2016 season! 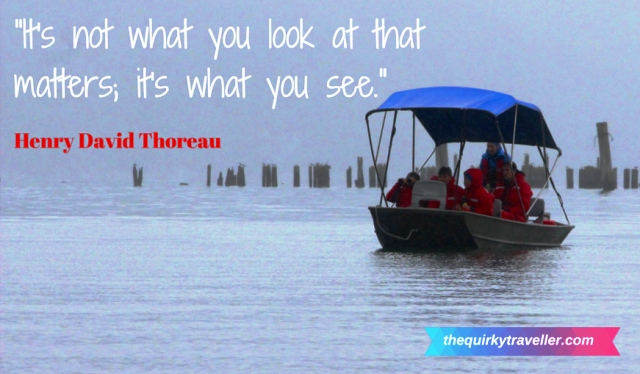 Thanks so much for sharing your experience of Alaska Margaret – sounds wonderfu. 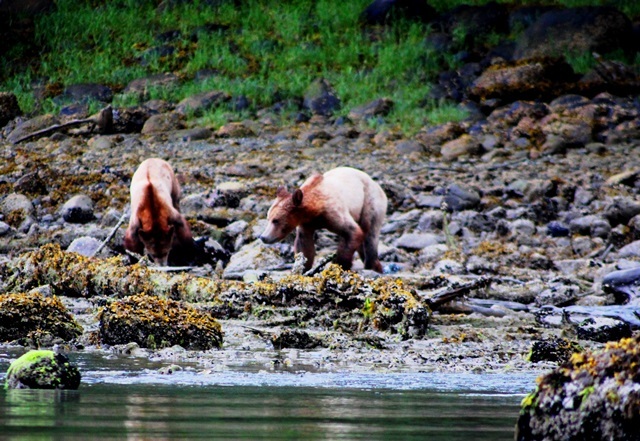 So glad you got to see the bearsat Knight Inlet – well worth the long haul from Oz!